This post has been many months in the writing and yet it is written without a road-map. September 9, 2017 marks the tenth anniversary of Prajnya’s launch and we’re busy making plans for the celebration weekend as well as this year. Last November, I took the call that we would no longer debate imminent closure; we seemed to be here to stay, at least for a while. But in recent months, I have been thinking of something very fundamental: Who are we? And as the only one in the organisation who remembers most things from the very beginning until this moment–actually a fourteen year span–I thought it was worth recording all the possible answers to this question as of this moment, while I remember them. As a historian-of-sorts, I am always thinking of the possibility that someday we will have been significant enough that someone will wonder about our history. That a women’s history project will feature us. In the first few years of imagining Prajnya, I never used the term ‘NGO.’ In my mind, Prajnya was going to be many different things and this may have described one attribute. I had never really been part of the social sector as it had evolved in the last two decades so I wasn’t thinking about a definition vis-a-vis anyone else, but just my imagination for this ‘space’ I wanted to create. Non-governmental organization? Because civil society’s engagement with peace, justice and security issues cannot be limited to a few fora. Public policy research organization? Because a plurality of perspectives is the foundation of learning. Publications and multi-media source? Because teaching, advocacy and communication bring learning to fruit. Networking hub? Because communication, networking and community-building is an essential part of the Prajnya vision. I was thinking on paper. What I was imagining was something bigger, more inchoate–a space, someday physical, making it possible to think across disciplines, holistically, without borders; a canvas for many media–both of exploration and of expression; an agenda that animates the interstices between existing fields; and a promise not to race to the limelight. We would be there, we would breathe, we would build, we would nurture, we would evolve. We would be all these things and then, something more, created by the imagination of everyone who joined our journey. Needless to say, once I started the process of founding Prajnya, I needed to find more limiting words, and words that would instantly be understood by others outside my head. Lawyer friends helped me identify the structure that would give me the greatest autonomy to stick to my original vision–a Trust. So we established that. And then, as we began to function, we needed words to describe ourselves to people. I sometimes used ‘space’ and watched people space out! Volunteers used ‘amaippu’ (organisation) to describe us in Tamil but we did not have even one full-time person until 2015! Sometimes, I heard them say ‘mayyam’ (centre) but we had no premises of our own. “Fair enough,” I would think, “but not exactly right.” Over the years, I learnt to tune out that critique. In English too, volunteers and I would use words like ‘organisation,’ ‘non-profit,’ ‘non-profit centre’ and even ‘NGO.’ Given that our vision was not conventional (“we shall deliver services,” “we are a social movement,” “we do advocacy”), it was handy to use the word that was most likely to make sense to people. In the beginning, I would attempt to describe our vision as it was in my head. People would listen closely, glazing over, and then say, “You should pick one thing and do it with focus.” Good advice, but not what I had imagined. Over the years, I realised that it was hard for even our volunteers to comprehend, remember and articulate the entirety of what I had imagined and founded. Introducing Prajnya or speaking about it, each one would simply recall, with pride and passion, the little piece of it with which they had been involved. I rarely stepped in to correct them, basking in their feeling of ownership instead. I realised understanding Prajnya would be for most people like the blind men and the elephant. I would just have to factor in that reality. A few months ago, I realised there was another dimension to this fundamental confusion. Most people now encounter us as an ‘NGO’ though we rarely use the word ourselves (as we still avoid nouns!). This includes donors, partners, resource persons, volunteers and most important, job applicants. Today’s NGO world is so corporate–offices, a full complement of staff, grants, reporting. This is a good thing insofar as it has brought transparency and accountability to this sector. Salaries range from government to corporate levels and for middle class/upper class kids, working in the social sector is no longer an option that has to entail sacrifice and delayed gratification. Jholas are now almost extinct! My revelation was this: I had founded and continued to run Prajnya in the mould of two quite different organisations than today’s corporate NGOs. First, when I imagine our work, our place in society, our approach and values, I imagine them in the mould of the women’s organisations and civil rights groups of post-Emergency India, which were early formative experiences. Poorly and personally resourced, all hands to deck, cause before personal growth, these were collectives unfettered by protocol and and social obligations and quite autonomous in their political positions. And they were and are political. Sometimes, by contrast, politics in today’s NGOs is like a designer accessory. The organisations I saw as a teen–the Forum against Oppression of Women, PUCL in Bombay–came from a different place and brought together people from many different causes and backgrounds. Second, I wanted Prajnya to emulate the standards of intellectual excellence I had seen in places like the Centre for Policy Research and the Centre for the Study of Developing Societies. I wanted it to host the eclectic and creative scholarship of the Asiatic Society of Mumbai whose revival I briefly got to witness. The catch is, that excellence requires resources. Again CPR’s model (then, at least) of self-financing through contract work was a possibility but I have never been able to bring that to Prajnya. I saw these two moulds–and continue to see them–as complementing each other and I wanted to bring them together in this ‘space’ I fashioned. I haven’t quite managed it. In our early years, we budgeted and planned like an NGO but raised money and grew with volunteer work just like those women’s organisations I had grown up with. I simply did not–arguably, do not–know how else to do this. In the last five years, the expectation has arisen that we would be like a contemporary NGO–have grants, corporate donations, good salaries, nice location–and when we look around and see that we don’t, there is a sense of failure. I sense it in the volunteers and then I internalise it. But in recent months, I have thought more and more: Is that who we are? It seems as if the road to our vision must pass through the toll-gates of such corporate NGO-isation. People tell me how to monetise our work and people shake their heads and say, “You must learn to say this in a way that people don’t feel guilty and will give you money.” I took a lot of this marketing advice in our early years and like the Panchatantra tale of the father, son and donkey, there were no happy endings. I was miserable and contorted, and we still had no large endowment or campus. And if I were now to confess that the thought of that makes my spirit grind to a halt, I am sure I would be considered stupid, impractical, wasting people’s time when I am unwilling to help us out by changing. The truth is, like most founders in the social sector, I am here because I have identified work that desperately needs to be done. Actually, I am going to stop saying ‘social sector’ and say ‘public sphere’–that may free me up a bit. I did not come in with a business plan or a fundraising strategy because although it is fashionable to use the term ‘social entrepreneur’, I am not an entrepreneur. I am here to do what I can, with others who feel the same way. Ideas and words are my strength and those who are drawn to Prajnya tend to be similar. Being small, growing at a glacial rate, is frustrating because our hearts and minds spin out ways to work faster than we can move. But when faced with the pressure to become someone else in order to do this work, I think now of the time and effort that would involve, and would rather invest that in doing whatever is possible. Is this the only way to grow? Is speaking a corporate language the only way to raise resources? Are external indicators of how much we have, where we sit, how many we employ, how many we reach, the only indicators of our ‘success’? Or should we celebrate our persistence? Does our success lie in those who have supported us for years and those who support us in every way they can and every chance they get? After ten years, we look around and see friends and believers everywhere, and it is a harvest of warmth and friendship that Prajnya reaps–is that our success, that we have created through our sincere effort, networks for change wherever we have gone? Is there a word to describe us? Is this not a path we can stay with? It seems to me, as the founder of Prajnya, that our biggest celebration would be to make our own way work for us, to stay true to our temperament and imagination and to show the world that this is also a way to be–away from the jargon, the expectations, the marketing and the hype. A good week, but we’re still not looking! This week, we received donations (counting pledges and undeposited cheques) of Rs. 73,000/-. I am almost afraid to be happy about this…. what if, what if, what if? Easier not to celebrate but to focus on the amount remaining–more than 50% in about 20 days. Will we make it? Someone asked me this week: Why May 31? Can’t people donate after that? Of course people can donate after that and they do year-round. But here’s the thing, a lot of what we do takes planning far in advance, and we can’t plan on money we don’t have. For instance we want to hold 3-4 roundtables for HR managers on workplace sexual harassment. To set dates, block our resource persons’ time, block a venue and go through the process of inviting, following up, chasing and reminding participants, we need a lot of lead time. Working back, that means we need to be fairly sure of a minimum amount of money in the bank as well. If we know June 1 what we definitely have to work with through the year, we will adjust our reach and plans accordingly. For now, on May 12, we have more than half of our fundraising target to meet. And we sit here, fingers and toes crossed and touching wood, not breathing, not wanting to look, hoping for the best. We leave with the gentle reminder that for Hindus, Akshaya Tritiyai is a really good day to donate. Whatever you do on this day will multiply. What you give us will multiply in our accounts. Whatever good karma you earn will multiply. And your ability to give will multiply. It is the gift that keeps on giving! PS: Suchitra Laxman made us a new fundraising presentation that introduces our work to new friends and also explains what we are raising funds for. Do share! Thanks! This week, Prajnya received Rs. 17,000/- in donations, all on the same day! And then we started this week with another Rs. 5000/-. Thank you to our donors! You know who you are! I am holding my breath, touching wood, crossing fingers and toes (you do too, please! )… please, please, please let this continue. We are still not even at 10% of our goal: Rs. 300,000/-. I want to write something about the timing of this drive. What is logical is for us to raise funds at around the time that people are looking for tax savings–the last quarter of the financial year. It also allows us to enter the year assured of the funds we need to do our work. However, that leaves us carrying over a larger balance amount than we’d like or should. The advantages of an April-May drive now seem many. First, we know what we are carrying over and can more accurately assess need. Second, given Chennai’s heat, it’s a quiet time for us anyway and our work tends to be routine and low-cost so it’s okay if funds are only trickling in now. Third, we started this drive on a common New Year’s Day (April 14) and it will take in Akshaya Tritiyai (May 13). We are hoping people will want to celebrate these by giving–to us, as well! When I have the money, I like to do that as part of my celebration. Finally, with the drive ending before the substantive planning for the 16 Days Campaign against Gender Violence begins, we should, hopefully, have the resources we would like and won’t have to spend our energies on fundraising closer to the time. Fingers crossed that this drive is successful! We have created a slideshow version of our fundraising appeal so that we (you and I) can share that as well. These days, when everyone is so busy and processing so much information all the time, the brevity of slides and bullet-points is handy. Take a look: With your help, we can do anything! The first stretch is the hardest? Week 1 of our 2013 fundraising drive just got done, and with just one donation of Rs. 1001/-: mine. That’s disappointing. We need to raise 3 lakhs (300,000 rupees). The hardest part of my work in Prajnya is keeping the faith–that this work is worthwhile, that we will find people, that we will find financial and material support. If I lose faith, then the most important function I perform–cheerleading–lacks conviction. In some stretches, nothing seems to work as it might. This has been such a stretch. It is clear to us we have pushed the volunteer team model to its limits. Using space at home is also limiting to everyone. And yet, moving out is not an immediate option. With so much awareness about gender violence post-December 2012, I have wondered what is left for us to do. But there is work–there is the deepening and widening work of imparting more information and more skills. There are still serious research gaps we aspire to be able to fill. And there is our other work. The work that actually inspired the launch of Prajnya–oral history and documentation on women’s work in the public sphere and peace education. For me, the near-comatose state of our peace education projects has been very saddening. I think, if we cannot do this work, then what work do we want to do at all? So to find that at the end of the first week, our fundraising drive has lacked both tail-wind and momentum, makes me anxious. Very anxious. At our last Trustees’ meeting, all of us were unanimous that it was now time to get a small office space of our own and to hire a full-time administrator. And we agreed that in fact, the administrator was more critical than the office. We can always borrow space, but we are finding that we can no longer manage with a part-time office team. The first casualty is efficient programme planning. We’re already short-handed without the hands that are available being preoccupied with logistical support and administrative housekeeping. But even scarier than that, as we enter Year 6, is the fear of falling behind on book-keeping. We believe, as do lots of others, that correctness and transparency are both critical to our legitimacy as a social organization. But as we grow and our lives get complicated, without a full-time person to sort us out, keep (us and) our papers in order, enforce a book-keeping discipline on us as we fly in and out of projects… this is getting palpably more difficult. Ironically, although everyone would hold NGOs to such standards, there are few organizations we know of that support administration and overheads. And wages in the social sector are almost exploitatively low. If we were to try and raise what our current volunteer administrator earns, we would be taken to task for profligate spending on peripheral items. We know however, how vital this work is to us as an organization. Prajnya is ready to take the next step. Can you help us figure out how to do that? Do you know of organizations who fund administrative and infrastructural expenses? Do you know of individuals who can see the sense in contributing towards this important need? Would you share this information with us please? Or share information about us with them (you don’t have to tell us)? If you would like to be our advocate and introduce us, we would be grateful. This is the time of year when people email me and say that they/their students would like to intern or volunteer with Prajnya. In principle, we welcome everybody. In practice, we’ve learnt there are some caveats and some concerns. For an internship or volunteer experience to work, both sides need to benefit and both sides need to feel good about the contribution of the intern/volunteer. So we have learned what the caveats are that we need to issue, beyond the mandatory, there is no money for this work. 1. We are not a service organization. So if someone is seeking a feel-good task like visiting the elderly, bathing strays in a shelter or distributing food packets, then we may be able to suggest another organization that can use your help. But we just don’t do that work. 2. We don’t have an office. So it’s not possible to come and help in the office every Thursday morning. 3. We actually don’t have assignable tasks. We are so small we only have responsibilities we are happy to share with or delegate with volunteers. 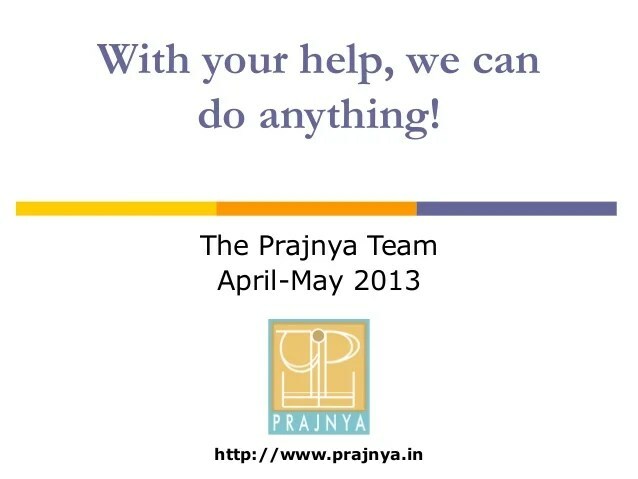 In fact, ALL Prajnya core team members are volunteers. We give our time, while earning a living. So the work happens all the time, and yet not all the time. For most people seeking to give time to an organization, this doesn’t work. And we understand that. Life is so demanding these days, we really appreciate the time people give us or your intention to volunteer somewhere. What does work for us is when people slowly start coming to our programmes like the monthly roundtables or to engage with us on social media, and then start getting more and more involved over a period of time. Every single person who is now a pillar has started gingerly and then taken ownership of the Prajnya vision. And we welcome that. What sort of person can best do that? 1. Someone with flexible time and mobility. 2. Someone who communicates promptly. 3. Someone for whom our cause strikes a chord. 4. Someone willing to start over and learn something new. I always think Prajnya is a good fit for people in their forties, seeking to re-enter the workplace, but not necessarily in need of paid work. You have education, skills, mobility and life-experience. You may enjoy working with us. What skills do we need? All skills. We often tell people who visit: Prajnya is like an Indian wedding. People come and go. Pick up the work in front of you so it gets done–folding clothes, putting away newspapers, whatever. Give yourself and us the time to discover what is your niche, the responsibility you can undertake most comfortably. And be prepared to be called out for everything–particularly at programmes, it’s all hands on deck. If you are around, there are things we can imagine doing because you’re there to help do them. If no one is around, we hesitate to create work. At that moment, when a volunteer organization approaches us, we have only the haziest ideas. So show up, get involved and we will know what we can hand over to you. We do need more people right now. We need people to come in now and grow familiar with our work. Our work has grown in the last two years but our team has not. Moreover, because it’s a team of young people, we have to endure through waves of coming and going–new jobs, new studies, new marriage, new baby. Still want to help but don’t have a long time. Don’t hesitate to email us: prajnyatrust@gmail.com. Tell us about yourself. Think in terms of skills you bring on board (can you improve our design skills?). Think of your hobbies (do you like to read? can you do reviews for us?). This work belongs to all of us. Feel free to check in with us to see what’s there to be done. This week, we received ZERO new donations. Yes, there are promises pending and at least one cheque in the mail, but especially in fundraising, a bird in the hand is worth many in the bush. As Managing Trustee, I share credit for Prajnya’s successes but all our shortcomings are a function of my own failures. So on a morning like this, I am left asking: what more could I have done? One route we have thought about often but never really pursued, largely because we end up being so overstretched and short of time, is to approach individuals in the corporate sector and ask for large donations. While we are a little leery of a “XYZ Pvt Ltd” sponsors Prajnya situation, we realise that our rock-solid support base of individuals cannot meet our needs. Most individual donations are in the range of 500-5000 Rs, and this goes a very long way because we are so frugal. However, having raised only 1 lakh where we need 8, we have to acknowledge that a few donations of 50K, for instance, could really help us without breaking a corporate’s back. People who get to know us, are ready to help out. But how to get them to get to know us? This chicken-egg roundabout has me dizzy! What we’ve learnt is that most MBA gyaan does not work for us. And fundraising tips are most suited to charity or service NGOs, not people like us. It’s been a steep learning curve but we’re learning now that it’s our story, in our voice, told our way, that gets us the most sympathetic listening and solid support. But how to get someone to give us that kind of time? Prajnya is the product of many dreams and dissatisfactions. These have taken many forms all my life, and finally taken shape as Prajnya. The first time I sat down and wrote up a document about Prajnya was in February 2003. This is what the cover said, and this is how I spelt Prajnya then. As the organization and the work have become more and more real, many things have changed, but we have retained the why this, why now, why thus from the very first document, changing only our spelling both to read more easily and also to facilitate domain registration. You can read these early notes here. I have been so anxious not to have Prajnya identified with me, and to develop a co-dependend relationship with the organization that I do not usually identify myself as a founder (though others sometimes do). But here it is, with this photo from the first doc I wrote, saved as ‘theme for a dream.doc’, my mea culpa. I am happy to state this is no longer just my dream. It belongs to everyone who has worked at Prajnya and everyone who supports us and now, you.